This triangular plot of historic park space, tucked within Manhattan's busy Civic Center (between Broadway, Park Row, and Chambers Street), delivers the perfect dose of downtime from the Downtown bustle, whether you're in the area for business or pleasure. Touting 8.8 acres of green lawns and pleasant landscaping, City Hall Park proposes the perfect perch to catch your breath, perhaps when heading to or fro the Brooklyn Bridge (accessible directly across from the park); to recoup following a shop-till-you-drop run through favorite neighborhood department store Century 21; or, to take a contemplative break after visiting the sobering nearby 9/11 Memorial and/or Museum. The park is primed for people-watching; at lunchtime, especially, it fills up with neighborhood workers—many of them government employees, or jury members from the nearby courthouses—who come to eat lunch and relax (who knows, you might even catch a glimpse of Mayor de Blasio himself, taking a break from the park's namesake City Hall, situated within the park's perimeters). You'll also likely count a wedding party or two in the mix, as they trickle through from their civil ceremonies at the nearby City Clerk's Office, for some post-nuptial garden shots. Plus, there's the constant ebb and flow of cyclists and pedestrians crossing the city's most famous bridge, the Brooklyn Bridge. There are also numerous landmark buildings that peek out around the park's borders, including the Woolworth Building, Manhattan Municipal Building, and more. Read up on some of the most notable of the bunch in this guide to City Hall Park's surrounding architecture. One of the most historically significant green spaces in the city, history buffs can look out for a spattering of historical markers posted throughout park (including a circular tablet depicting key events in the park's history, set at its southern edge). City Hall Park's grounds have seen many incarnations. Its western borders are marked by what was once an old Native American trail (now famously known as Broadway), and the park became known as "the Commons" in the late 17th-century when it was used as a communal pasture for livestock. The grounds served as the site of 18th-century almshouses for the city's poor, and later, the northern end of the park (where the Tweed Courthouse now stands), was the setting for a British-built soldiers' barracks and debtors' prison (during the American Revolution, the prison was controlled by the British to hold Revolutionary prisoners-of-war—many of which succumbed to starvation or were executed nearby). Most famously, the park served as military parade grounds where George Washington, along with regiment brigadiers and colonels, read the Declaration of Independence aloud to their troops (on July 9, 1776), as they prepared to battle the British. In 1818, the city's first art museum opened here, in the now-demolished Rotunda building (which came down in 1870). The park (and its City Hall building) also claims a long history of gatherings, rallies, and public events that continue on through to today. One particularly notable historic event on the grounds: President Lincoln laid in state at City Hall following his assassination in 1865. 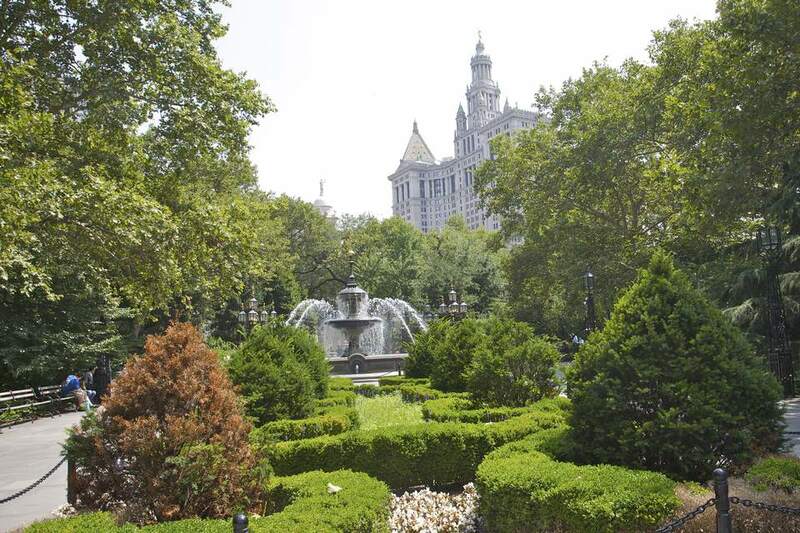 City Hall Park's centerpiece today is its lovely granite fountain (dating to 1871), which stands as its southern edge. Look for a bronze gas-lit candelabra at each corner, and an umbrella-shaped fixture above its central circular basin. (This fountain replaced the park's original Croton Fountain, which brought fresh water in from the Croton Aqueduct—set 40 miles north of the city—an engineering feat of the day when it debuted in 1842). Designed by Jacob Wrey Mould (co-designer of Central Park’s Bethesda Fountain), the fountain you see today was moved to Crotona Park in the Bronx in 1920, before being restored and returned to City Hall Park in '99—part of a massive, nearly $35 million park restoration that year. The park's original gas streetlights were replaced by electric lamps in 1903—the transporting, vintage-style light poles that stand today include old-fashioned "Fifth Avenue" poles on the sidewalks, and ornate cage poles along the central path. More than a dozen markers and monuments are spread throughout the park space (though note some are cordoned off due to security measures at the City Hall building). Look for Frederick MacMonnies’s 13-foot-tall bronze statue depicting colonial patriot Nathan Hale, an American Revolution-era spy, best known for his dying words, “I only regret that I have but one life to lose for my country.” He was hung for treason by the British in 1776, at just 21 years of age. Among the many interesting historical markers is one fronting City Hall, which pinpoints where the initial excavation was made for NYC's first subway in 1900 (unfortunately, the plaque now falls behind security blockades, and is no longer viewable to the public). First opened in 1904, the old and now-closed (since 1945) City Hall subway station lies underfoot, marking the southern terminal of the city's very first subway line. It was designed to be the showpiece for the new underground railway system, with skylights, brass chandeliers, Guastavino tile, and glass tilework. While it's still used a turning point for the 6 train, it's otherwise a ghost station—though New York Transit Museum members can sign up for occasional guided tours to see firsthand the impressive underground relic.